New York: Harper & Row, 1990. 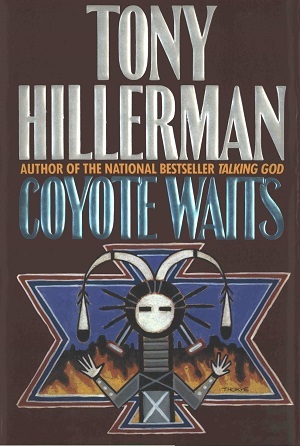 This is the first edition of Coyote Waits, which is Tony Hillerman's tenth Navajo Mystery novel. This edition was published in 1990 by Harper and Row Publisher's Inc. in New York City, New York. The cover illustration is by Peter Thorpe, who designed a majority of the American covers, and depicts a Yeii figure with a fire blazing inside a geometric pattern in the background. Format: Hardback, 24 x 16.3 cm. Binding: Orange boards with a maroon cloth spine with a southwestern geometric symbol embossed on the front board. The author, title and publisher are printed vertically in gold on the spine.